Norbert, originally from Germany, has lived in Switzerland for ten years. He recently retired from his job as a director of a special telephone information service for the Swiss Federation of the Blind. Norbert has used Be My Eyes from the very beginning, but can feel an enormous difference in the quality of the service since he joined. Initially, he didn’t always get a reply to his calls, but today it rarely happens. I almost always get an answer, and if it doesn’t happen the first time, it will happen the second time. He adds that today it is much easier to get help in German, his native language. One of Norbert’s favourite experiences with Be My Eyes was when he received a piece of artwork as a gift. A Be My Eyes volunteer gave him a detailed description of the picture so that he could clearly imagine how it looked. One of the daily tasks that Norbert uses Be My Eyes for is operating his coffee machine. The machine has a screen where you can switch between two pages for different types of coffee. But it's not accessible for blindness or a lower level of vision, so there’s no way for Norbert to know which page he is on. Norbert has memorized the different types of coffee on each page, so he can easily tell, which page he is on from the volunteer’s description. Instead of ending up with the wrong type of coffee in his cup, he gets a volunteer to describe what is written on the screen. Norbert’s girlfriend is also blind. She works as a cosmetics counselor, and when she receives new products by mail, all the products are mixed together in one box. She uses Be My Eyes to distinguish between the different products before testing them. 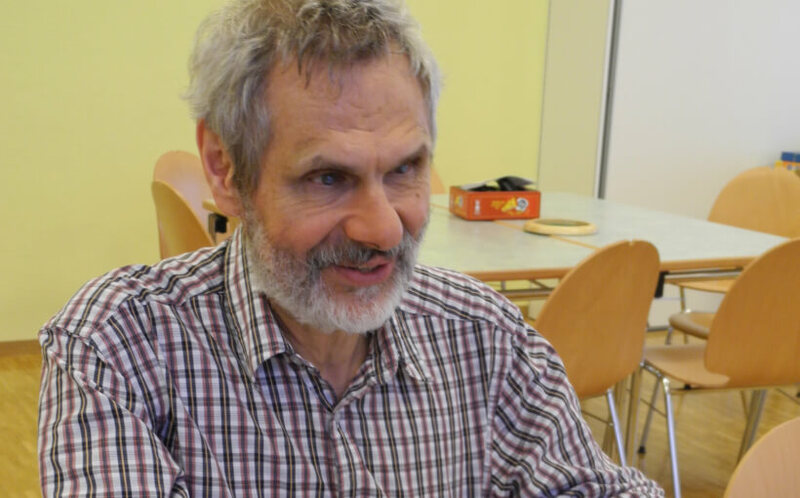 Board games and card games are some of Norbert’s favorite hobbies - and so is making them more accessible for blind players. When he got a new card game, he wanted to put braille labels on the each one to be able to read it. The cards were arranged in two decks, and he knew that they were in the right order, so he didn’t actually need any sight to complete the task. But occasionally he would forget which way he had turned the card, and this is where Be My Eyes came in handy. A volunteer quickly told him which side of the card was facing up, so that he could put the braille label on the right side. One of the important things, which have changed in my life through Be My Eyes, is that I do not always have to wait until a sighted person comes along. So now I’m very independent as far as that is concerned, and I get the information whenever I need them.